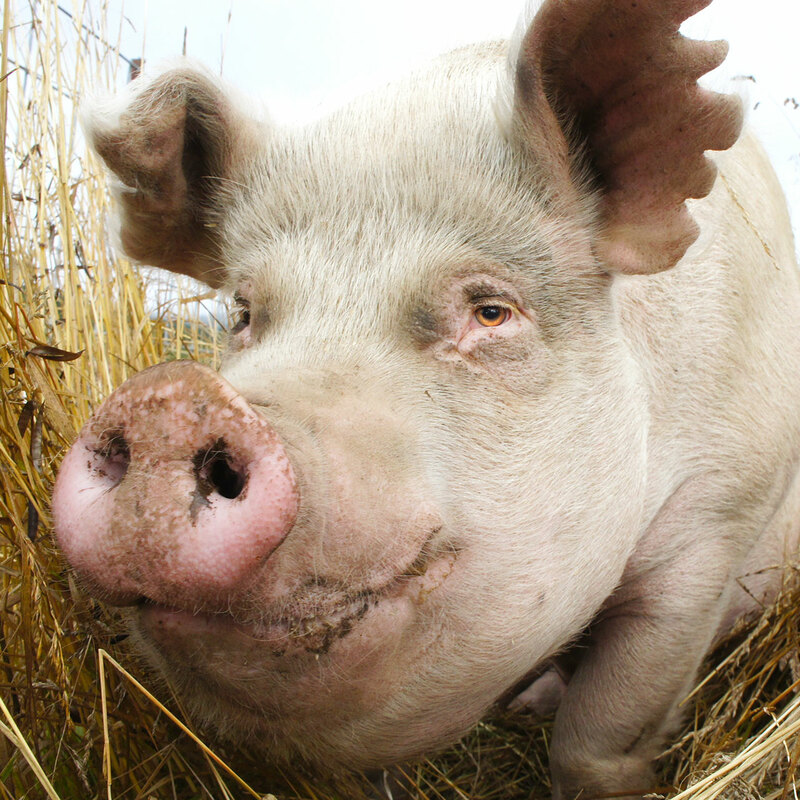 Pig production at universities of higher learning? 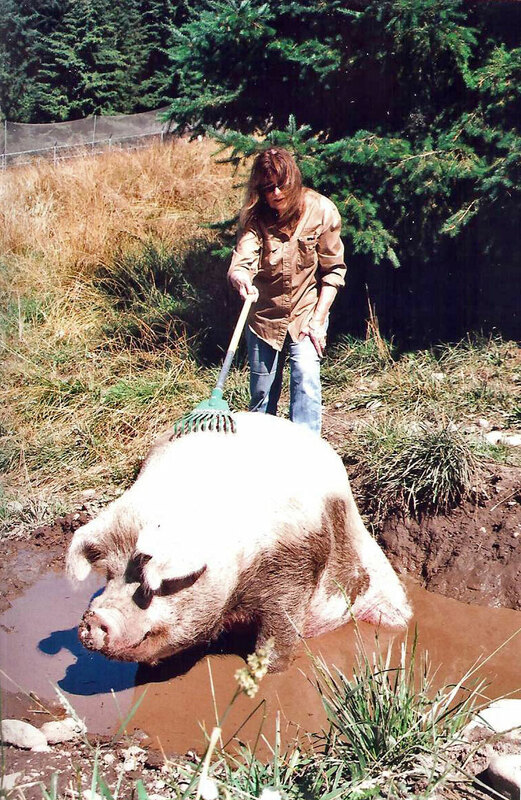 Floppy and Wilbur were rescued from the Oregon State University Swine Center in 2011. Both were three months old. Each one was picked up squealing in fear and placed together in a large dog carrier. Upon leaving, it was heartbreaking to see the sad eyes of their litter mates left behind and hear their fate from the Swine Manager, “nothing gets out of here alive after six months.” Floppy and Wilbur were now free from their small concrete pens inside a small deteriorating long metal shed. No more would they cower in a corner with others while their sterile environment was periodically hosed down with a high pressure hose. 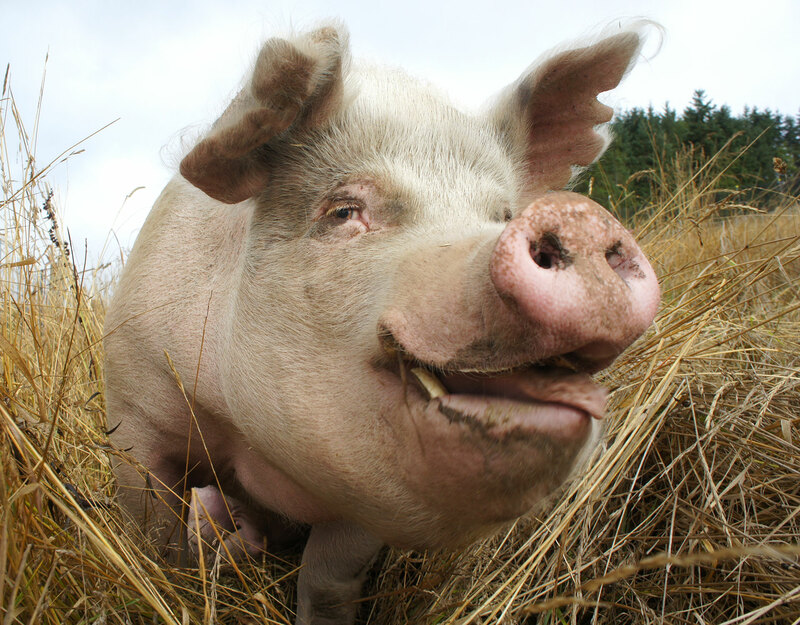 Now at Precious Life Animal Sanctuary, they are free to explore in tall grass, root and roll in mud, dis- play their natural playfulness with one another, and grunt in their own language to each other and to their human counterparts. Most importantly, they can live out their lives free from human exploitation knowing their caregivers value them as unique individuals. It remains to be seen how healthy and how long they will live given various swine research that was conducted: selectively bred to enhance certain cuts of meat for human consumption, chemicals to stimulate growth, and feed formulas to enhance weight gain all to maximize ROI (Return on Investment). The most offensive and inexcusable part of this swine program was that the 60-year old shed was surrounded by pasture. At minimum expense, a fenced enclosure could have been constructed next to one side of the barn to at least allow the pigs to experience their natural instincts being outdoors during their short lives. The good news is the Oregon State Swine Center closed their swine program and sold off their pigs as of September, 2013. The reasons cited were financial and manure leakage which also closed down their dairy operation for a while due to manure leakage in a nearby creek. Caryl performing rakey on Floppy. The Washington State Swine Center was toured years ago which consisted of rows of young pigs housed individually in concrete cages with metal bars forced to remain in the same position. Most had their snouts protruding through the metal bars and many were engaged in repetitive motions of head swaying and bar biting to relieve the overwhelming stress that was never going to end. It was eerily quiet as the pigs in this depressed state had given up any struggle to be freed long ago. The housing was automated in the feeding, watering and lighting which kept the area in darkness for long periods of time to maintain the captive pigs in a subdued, helpless state which resulted in minimum human involvement. To have witnessed needless suffering of a highly intelligent animal at academic institutions is offensive and impossible to ever forget. While Oregon State and Washington State Universities were mere bit players for the pork industry, the magnitude of misery at state universities in pork producing states is enormous. All these “academic institutions” are supported by agri-business and all view the lives of pigs as nothing more than production units to be exploited for profit. If Animal Science Departments at State Universities across the U.S. are financially challenged, they need to re-think their priorities and use part of the incredible revenue from inter-collegiate athletics to do the right thing, abolish all factory farm confinement systems and initiate suitable habitat and housing for their farm animals to experience their basic instincts. The time is long overdue for these institutions of higher learning to require a core course in humane education to deepen compassion and respect for all life and re-educate the so-called “experts”: the teachers, professors, scientists, corporate executives, and government officials, benefitting from the pork industry. As a whole, they do not believe intensive confinements systems are cruel. Take, for example, Dr. David Meisinger, Executive Director of U. S. Pork Excellence, who in his career was general manager of a 30,000 sow operation and does not believe gestation stalls (cages) are inhumane. All pregnant sows in these factory farm operations are confined in individual steel barred gestation cages for over 3 months that measure two feet by six feet, with no straw or bedding and the mother sow cannot move forward, backward or turn around. Upon giving birth, the mother sows are moved into another barren steel farrowing cage with the height lowered so she is completely in a prone position with her teats exposed to prevent the piglets from being crushed in this un- natural human-created hell. It should be noted many European countries have outlawed battery cages, gestation crates, farrowing crates and mandate practices that free farm animals from intensive confinement. Wouldn’t it be beneficial for proponents of factory farm intensive confinement systems to be injected with a dose of reality to stimulate a sense of empathy? One sure way to accomplish it which would be viewed by some as inhumane while others would see it as equal justice would be to release swine from intensive confinement cages and replace them by forcing the individuals responsible for the misery into the cages against their will and then count the hours until these human victims beg for mercy to be let out or show pending signs of insanity. While the above experiment makes perfect sense, it will never happen so the question is, what can I personally do to lessen the horrific suffering of billions of farm animals? DO NOT EAT THEM! Adopt a Plant-Based Diet and Extend your Life. Is anyone foolish or naïve enough to believe that agri-business cares about human health? They, like the cigarette companies, care about one thing and that is making money regardless of the suffering they cause.